Chaos and Order in the Capital Markets was the first book to introduce and popularize chaos as it applies to finance. It has since become the classic source on the topic. This new edition is completely updated to include the latest ripples in chaos theory with new chapters that tie in today's hot innovations, such as fuzzy logic, neural nets, and artificial intelligence. This second edition of Chaos and Order in the Capital Markets brings the topic completely up to date with timely examples from today's markets and descriptions of the latest wave of technology, including genetic algorithms, wavelets, and complexity theory. Chaos and Order in the Capital Markets was the very first book to explore and popularize chaos theory as it applies to finance. It has since become the industry standard, and is regarded as the definitive source to which analysts, investors, and traders turn for a comprehensive overview of chaos theory. Now, this invaluable reference - touted by BusinessWeek as "the bible of market chaologists" - has been updated and revised to bring you the latest developments in the field. Mainstream capital market theory is based on efficient market assumptions, even though the markets themselves exhibit characteristics that are symptomatic of nonlinear dynamic systems. As it explores - and validates - this nonlinear nature, Chaos and Order repudiates the "random walk" theory and econometrics. It shifts the focus away from the concept of efficient markets toward a more general view of the forces underlying the capital market system. Presenting new analytical techniques, as well as reexamining methods that have been in use for the past forty years, Chaos and Order offers a thorough examination of chaos theory and fractals as applied to investments and economics. This new edition includes timely examples from today's markets and descriptions of cutting-edge technologies-genetic algorithms, wavelets, complexity theory-and hot innovations, such as fuzzy logic and artificial intelligence. Plus, Chaos and Order now contains a Windows-compatible disk including data sets for running analyses described in the appendices. Written by a leading expert in the field, Chaos and Order in the Capital Markets has all the information you need for a complete, up-to-date look at chaos theory. This latest edition will undoubtedly prove to be as invaluable as the first. 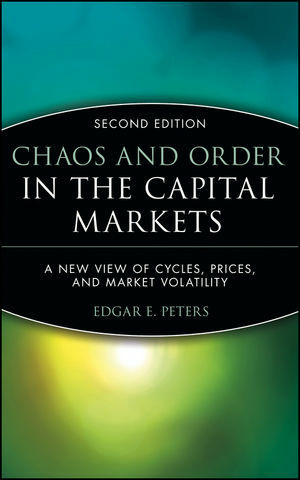 EDGAR E. PETERS is an expert on chaos theory and its financial applications. He is Chief Investment Strategist and Director of Systematic Asset Allocation for PanAgora Asset Management, Inc., a global investment management firm. He is a frequent lecturer on market theory, and has taught investment and portfolio management at Babson College, Boston College, and Bentley College. In addition to the first edition of Chaos and Order in the Capital Markets, he is the author of Fractal Market Analysis and numerous articles in professional journals. Introduction: Life Can Be So Complicated. Random Walks and Efficient Markets. The Failure of the Linear Paradigm. Markets and Chaos: Chance and Necessity. FRACTAL STRUCTURE IN THE CAPITAL MARKETS. Fractal Time Series-Biased Random Walks. R/S Analysis of the Capital Markets. Introduction to Nonlinear Dynamic Systems. Dynamic Analysis of Time Series. Dynamic Analysis of the Capital Markets. Fractional Truth: Fuzzy Logic and Behavioral Finance. Applying Chaos and Nonlinear Methods. What Lies Ahead: Toward a More General Approach.